"In the beginning of all things, the One Above sent certain animals... to tell men that from the stars and the sun and moon should man learn." This article explores the fighter part of us all - how energy is expressed and utilised, where ambition and enterprise is focused, convictions, enthusiasms, and so on. The dictionary defines a warrior as - 'A person experienced or distinguished in fighting...' Initially, this definition is likely to conjure up images of conflict and aggression or perhaps of pugilism or warfare. However, the concept has a considerably broader and far more positive potentiality. To fight literally means to combat, to take action, to confront or to battle. It is true that at its most negative, a disruptive and querulous impulse can give rise to antagonism, strife and contention. But at the opposite end of the spectrum, the impetus is to take on challenges to overcome difficulties, to surmount problems and to champion causes. Mars is often called 'The Warrior Planet', and being the last of the personal planets its influence is often very marked in the birthchart. In essence it is an incentive for action, the force of spiritual energy seeking expression through and in the physical plane. Its nature is fiery, outgoing, initiating and assertive, and as such, defines the warrior part of you - how you express and utilise your energy, where you take the initiative, what you stand for, how you get things done, what makes you angry, and so on. Like all the planetary energies, Mars in the horoscope manifests through a particular sign, in a particular house, and is tempered by the aspects it makes. When it is well placed in a chart, it confers courage, strength and independence, awakening in the soul the desire to do what is right and the urge to pursue new enterprises and undertakings. Zeal, determination and persistence are usually present enabling projects and enterprises to be successfully instituted. A direct approach and a lively attitude can be actuated too as can strong leadership qualities - perhaps especially so in arduous or demanding circumstances. When less favourably placed, the fiery energies of Mars can operate to excess. Here, they can manifest as an intense need for freedom and a dislike of interference that makes the individual somewhat over-hasty, undiscerning or rebellious, or perhaps bitter if they at any time feel thwarted. There is also a possibility of belligerence, rancour, unbridled anger, or a hot temper, and these qualities if left unchecked could result in quarrels and separations, defiance against authority, recklessness or at worst cruelty and violence. How the dynamism of this planet is likely to be channelled and applied is determined by its natal position and as the life progresses, by progressions and transits. In youth especially, misdirected energy can result in impatience, or in an unrestrained attitude leading to rash decisions and behaviour. However, as one cycle after another of this planet is experienced, the opportunity to learn to control and direct this power is given to the soul. Thus with maturity, it is often the case that the fighting proclivity of the Martian force is much more equitably implemented. When used in an effective manner, Mars can be a powerful force for good. To work at its highest potential, it does need appropriate channels and outlets to enable the person to positively assert their own individuality. When flowing freely, the energy of this planet provides strength and fortitude, a strong fighting spirit, and the ability to accomplish exacting tasks. These are the people who get things done, whose passion, endurance and mettle enable them to cope with challenges - both on an inner level and in the material world. The drive to succeed can be directed within in spiritual aspiration, or outwardly by working for a cause or fighting an injustice on behalf of those less forthright, on the other hand, testing oneself against physical problems or in sport or adventure may be the chosen path. "Mars is often called The Warrior Planet, and being the last of the personal planets its influence is often very marked in the birthchart." With no positive outlet for this energy, the power could be expressed in arguments and disputes or through acting in an antagonistic irritable or domineering manner. In this case, the animal nature may tend to go unchecked, allowing tumultuous disorderly thoughts - the outcome of which might well be obduracy or indifference to detail, or at worst, it may seem as if the soul is battling with itself as the inner turbulence holds sway. Mars rules the sign of Aries, and co-rules Scorpio, and so is extremely powerfully placed here. In each of these signs, a very high level of energy is suggested - primarily in the aspirational and emotional arenas respectively. Mars in Aries signifies a need for a physically demanding interest, where the person can test their resolve and their natural ebullience can find a happy release. Such diverse activities as dance, exercise or mountaineering could be chosen as such a means. A challenge of Mars in Scorpio is to harness the emotional power and to become aware of unconscious desires. It suggests an intensity of feeling and a strong intuitive quality. At best, the love of purity and truth can bestow the soul with the courage to fight its inner negativity and shortcomings. Mars is very happy in the sign of Capricorn too, as it is said to be in its exaltation. In this placement, the influence of the planet is tempered and beautified and so it can often demonstrate its most spiritual side. In this placement, there can be considerable ambition and the will to achieve. The driving force is frequently a determination to get to the top, and with the potential for controlled and disciplined energy being evident, this is often accomplished. In Pisces, the level of physical energy may be less than in other signs, but when the emotions are channelled creatively, this is a very good placement for artistic expression. On the other hand, in certain signs, there can be a proclivity for the Martian energy to be more difficult to access. For example, in Libra, the sign of its detriment, there can be much procrastination, giving rise to a lackadaisical languid approach to life. Perhaps here the soul is being challenged to fight passivity. In Taurus, the energy is usually controlled, but there can be a great deal of stubbornness and perhaps too an over-zealous liking for routine which can stifle the spontaneity of Mars. A lesson here might well be to fight these tendencies and to supplant them with a little more flexibility. Perhaps this planet might best be viewed as a medium through which the wise employment of the life-force is learnt. It confers the soul with vigour, drive and motivation. Steady and well-directed effort is called for, along with the pursuit of many productive and enjoyable outlets in order to both harness and implement its full potential. If not, then the inherent exuberance tends to be over-done, leading to carelessness, impetuosity and on occasion too perhaps, a somewhat explosive and wilful attitude which can antagonise other people. "The same basic principles apply in forecasting." The same basic principles apply too in forecasting. In past times, the influence of Mars was not welcomed as it was always considered to be a harbinger of trials - of difficulties and problems of one sort and another. Nowadays, the Martian ideal is seen as directed effort, focus, action and incentive. Through progressions and transits, the soul is given the chance to bring enterprise, courage, enthusiasm and strength of will to the various aspects of the life. The progressed chart reveals ways in which the individual may change - in behaviour and in attitude - as this energy is applied. Here, Mars is indicative of vitality and drive, and it can also indicate favourable times for personal development and promotional interests. However, if no physical expression is given to this energy, then difficulties may arise. For example, underlying anger or resentment needs to be expressed otherwise outbursts of uncharacteristic fury could occur. It is possible too that if there is no other channel for this energy to work through, then accidents are possible, and with Mars being a fire planet, burns or sharp instruments are liable to be involved or feverish illnesses or infections could ensue. As in the natal horoscope, Mars can turn retrograde in the progressed chart too. At such times, there may be a tendency to over-react to situations, either by being too forceful or by responding in an overly sensitive manner. This is likely to be an instinctive rather than conscious reaction. The challenge here is to become aware of any self-defeating patterns and to appoint new and more conducive ones in their place. "How the dynamism of this planet is likely to be channelled and applied is determined by its natal position and as the life progresses, by progressions and transits." 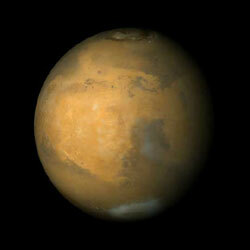 Transits of Mars can show when and where the energy and impulse of the individual are likely to manifest. It takes approximately two and a half years to travel the chart, and as it passes through each house in turn, it vitalises and activates the planets therein as well as that particular area of life activity. When a planet receives a Martian transit, selfhood can be established through issues related to that particular planetary principle. Through the houses it energises the affairs of that house. As with progressions, conflicts can arise with the people associated with the planet or house if the energy is not channelled wisely, and again, misdirected or unexpressed energy could result in illness or accident. Transiting Mars can bring challenge or incursion, depending upon the aspects formed, the natal position of the planet, and the use the soul is able to make of the energy available. The beginning of a Mars cycle - that is when transiting Mars is conjunct natal Mars - is a good time to start afresh. As it squares its natal position, then opportunity for change or tests of forbearance are likely to be forthcoming. When it opposes natal Mars, it suggests a good time to review the current situation and to instigate any necessary changes to revitalise the outcome desired. A few examples will serve to illustrate some of the potential helpful - and not so helpful - outworking of the Martian energy. A transit to Venus can impel the person to seek out a romantic relationship - this can be done in either a gentle or an aggressive manner depending upon the various chart factors involved. A transit to Mercury denotes mental stimulation can be sought. Again, this can be done in either a constructive way or less subtly by manipulating others into sharing more information than perhaps they intended to. When travelling through the first house of the natal chart, then transiting Mars implies self-assertion, helping the individual to stand firm in order to effectively further their plans and objectives. However, sensitivity to the needs and wishes of others is needed too so as to forestall the possibility of arguments and misunderstandings arising. When passing through the tenth house, ambition is strongly activated. At this time, much energy, enthusiasm and effort can be positively directed to the career or to a cherished project. On the other hand, without due control and direction, then difficulties or conflict with authority figures or co-workers could transpire. This article was first published in the Astrological Journal 'Altair' in August 2004. As can be seen, Mars, the planet of energy and desire, when strongly activated in the chart, is associated with times of vivacity, power and animation. The reasoning faculty can be excited with an idea or feeling prompting action, quick response, aspiration or emotion. The challenge is to use this force to the best possible advantage - both for personal progress and growth, and for the benefit of other people. By being aware of and working with this energy, it can be used constructively, and any negative effects can be avoided or at least moderated. If not, then there is a likelihood of irate encounters, mishaps, or the experience of other unsettling conditions. Life on the Earth plane involves coping with demanding circumstances and attributes. The role of the Warrior Planet is to equip the soul to fight, to combat, and to contend with such factors - and ultimately to prevail over them. On an inner level, the lesson is to harness and wisely steer the spiritual fire within. During this process, there are many personal battles to be won, and many internal conflicts to be reconciled. In the outer life too, there is a need to take command of this spiritual energy, to confront both physical and interpersonal challenges, and to focus the inherent fighting spirit towards elevating self, and bettering the world for all.